How Does a Story Start? Writers have a myriad of different methods for starting a story, and writing a story. Some write linearly – they have an opening scene and a pretty good idea of their characters, and how the story should end. They start at the beginning and end at the end. Other writers are “pantsers,” taking the barest shimmer of an idea and sitting and letting their fingers fly on the keyboard, building the story as they go without any type of outline. Some writers are character-focused They have a great set of characters, and build the story around them. Some writers are scene-focused. They imagine a scene, and build their story around that. These last two types are sometimes called “spiral writers.” A spiral writer has a kernel of an idea to work with. Someone they saw or met, or a scene they observed somewhere, becomes the idea that inspires the bigger story. From that central idea the story spirals bigger and bigger, like a shell, until that small seed at the center turns into a complete story. I am one of those writers. Usually, my “seed” is a picture of a man. He doesn’t have to be doing anything in particular, but something about him needs to be memorable or trigger some emotion in me. This picture was the seed for Fairest of the Faire (coming June 2015 from The Wild Rose Press). I was visiting the local renfair with my BFF Erika, our two girls with us (12 and 10 at the time). This guy definitely caught my eye. He caught Erika’s eye too. We giggled like middle-schoolers. Then we took his picture. And then, there was a story building in my mind. 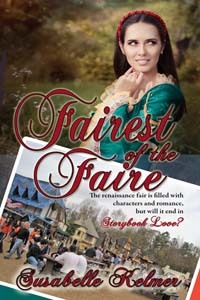 Fairest of the Faire features Gage Youngblood, a carpenter, avowed bachelor, and sometime Faire performer, and Connie Meyers, a widowed schoolteacher with a couple of dark-suited goons stalking her. When I built the character of Gage, I used this picture as inspiration. The real man in the picture will never know, because I never got his name, not even when I asked him to stand for a picture with the girls. That scene ended up in Fairest of the Faire. Not that I’m a huge man-watcher. Well, that’s what I’d like to say. But I’m married, not dead, and I recognize a good looking man when I see one. The barbarian at the renfaire was one of many inspirations I could have latched onto. There are always really great looking, costumed players at the renfaire. So, I guess I AM a man-watcher! The latest man I want to write a story for is this guy. His picture appeared in the paper, in a story about an ongoing lawsuit against a skydiving company at our local airport. He looks so intense, so focused. I’m sure there’s a story in there somewhere. I’ll find it, and he will become the hero in a future novel. My BFF Erika is still my favorite man-watching buddy, even though we live a thousand miles from each other. We share pictures of kilted men on our facebook pages all the time. Our friends think we are crazy. But how can we help ourselves? So many good-looking men, so little time! An excerp t from Fairest of the Faire, coming June 5 from The Wild Rose Press!